Before me lay at least five compounds that could explain how the spry centenarian had eluded the diseases of aging to reach her 104th year with the flexibility of a yogi and the frenetic energy of a Chihuahua. Excerpted from The Blue Zones Solution by Dan Buettner, publishing April 7, 2015. While this may sound like the inventory of a well-stocked medicine cabinet, we were actually standing in Shinzato's kitchen garden. The "supplements" on display were Okinawan sweet potatoes, soybeans, mugwort, turmeric, and goya (bitter melon). All of these grew in neat rows, just 15 steps outside of her house. The day before, I'd traveled to her village in northern Okinawa with two longevity experts, gerontologist Craig Willcox, who along with his brother Bradley wrote the New York Times best seller The Okinawa Diet Plan, and Greg Plotnikoff, a U.S.-trained physician and authority on integrative medicine. We spent the day interviewing Shinzato about her diet, observing her lifestyle, and watching her prepare a traditional Okinawan meal. In the cool hours of the day, she worked in her gardens. At lunch, she mixed homemade miso into a saucepan of water. She spooned in fresh carrots, radishes, shiitake mushrooms, and tofu, and let it heat. Meanwhile, she moved up and down the kitchen wiping clean the counters, sink, and even the window. When it was ready she poured her warmed soup into a bowl, gazed at it for a few moments, and murmured, "Hara hachi bu." This Confucian adage, intoned like a prayer before every meal, reminded her to stop eating when she was 80 percent full. After lunch, she read comic books or watched a baseball game on television and napped. Neighbors stopped by every afternoon, and a couple of days a week her moai -- four women who, together with Shinzato, had at a young age committed to one another for life -- stopped by for mugwort tea and conversation. Whenever things had gotten rough in Shinzato's life, when she'd run short of cash or when her husband had died 46 years ago, she'd counted on her moai and the Okinawan sense of social obligation -- yuimaru -- to support her. Her friends had relied on a lifetime of Shinzato's support in return. Okinawa is sort of a Japanese Hawaii -- an exotic, laid-back group of islands with warm weather, palm trees, and sugar-sand beaches. For almost a thousand years, this Pacific archipelago has maintained a reputation for nurturing extreme longevity. Okinawans over the age of 65 enjoy the world's highest life expectancy: Men are expected to live to about 84, while women are expected to live to almost age 90. They suffer only a fraction of diseases that kill Americans: a fifth the rate of cardiovascular disease, a fifth the rate of breast and prostate cancer, and less than half the rate of dementia seen among similarly aged Americans. All Okinawans age 100 or more who are alive today were born between 1903 and 1914. During the first third of their lives, roughly before 1940, the vast majority of the calories they consumed -- more than 60 percent -- came from one food: the imo, or Okinawan sweet potato. A purple or yellow variety related to our orange sweet potato, the imo came here from the Americas about 400 years ago and took well to Okinawan soils. This sweet potato -- high in flavonoids, vitamin C, fiber, carotenoids, and slow-burning carbohydrates -- is one of the healthiest foods on the planet. The traditional Okinawan diet was about 80 percent carbohydrates. 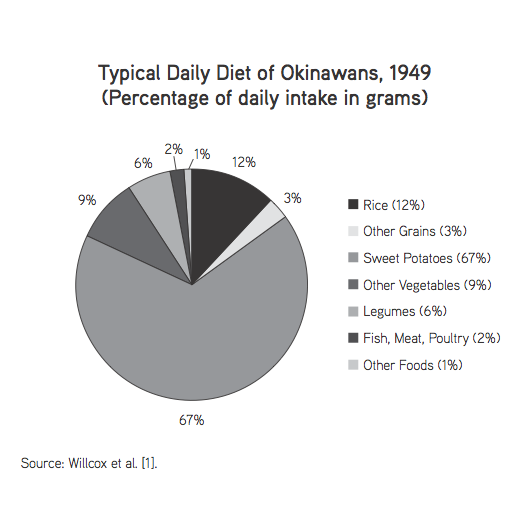 Before 1940 Okinawans also consumed fish at least three times per week together with seven servings of vegetables and maybe one or two servings of grain per day. They also ate two servings of flavonoid-rich soy, usually in the form of tofu. They didn't eat much fruit; they enjoyed a few eggs a week. Dairy and meat represented only about 3 percent of their calories. On special occasions, usually during the Lunar New Year, people butchered the family pig and feasted on pork. The meat in their diet gave me pause. When I first struck off on my Blue Zones research in 2000, I was absolutely convinced that I'd find that a vegan diet yielded the greatest health and life expectancy. So when I discovered that older Okinawans not only ate pork but loved it, I thought their example must be an outlier -- that they were living long despite pork. Pork is high in saturated fat, which, when consumed in excess, often leads to heart disease. But again, we learn a few lessons. Okinawans stewed the pork for days, cooking out and skimming off the fat. What they ate, in the end, was the high-protein collagen. As healthful as they were, some of these Okinawan food traditions foundered mid-century. Following the war, western influences -- and economic prosperity -- crept into traditional life and food habits changed. Okinawans doubled their rice consumption, and bread, virtually unknown before, also crept in. Milk consumption increased; meat, eggs, and poultry consumption increased more than seven-fold. 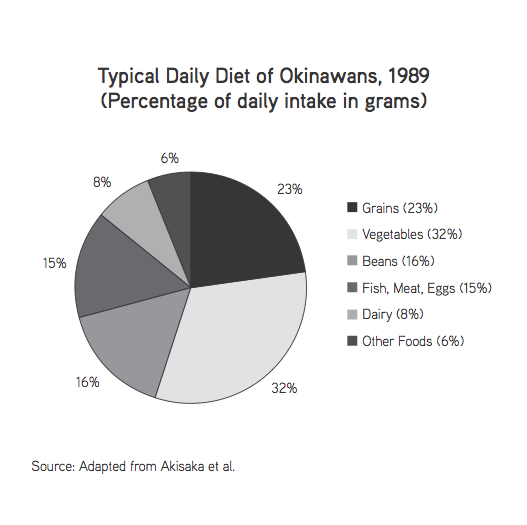 Between 1949 and 1972 Okinawans' daily intake increased by 400 calories. They were consuming more than 200 calories per day more than they needed -- like Americans. Cancers of the lung, breast, and colon almost doubled. BITTER MELONS: Known as goyain Okinawa, bitter melon is often served with other vegetables in a stir-fried dish called goya champuru, the national dish and cornerstone of the Okinawan diet. Recent studies found bitter melon an "effective anti-diabetic" as powerful as pharmaceuticals in helping to regulate blood sugar. TURMERIC: Ginger's golden cousin, turmeric figures prominently in the Okinawan diet as both a spice and a tea. A powerful anticancer, antioxidant, and anti-inflammatory agent, turmeric contains several compounds now under study for their antiaging properties, especially the ability to mimic caloric restriction in the body. Its compound curcumin has shown in both clinical and population studies to slow the progression of dementia -- which may explain why Okinawans suffer lower rates of Alzheimer's disease than Americans do. SHIITAKE MUSHROOMS: These smoky-flavored fungi, which grow naturally on dead bark in forests, help flavor Okinawan's customary miso soup and stir-fries. They contain more than 100 different compounds with immune-protecting properties. Purchased dried, they can be reconstituted by soaking or by cooking in a liquid like a soup or sauce, and most of their nutritional value remains.